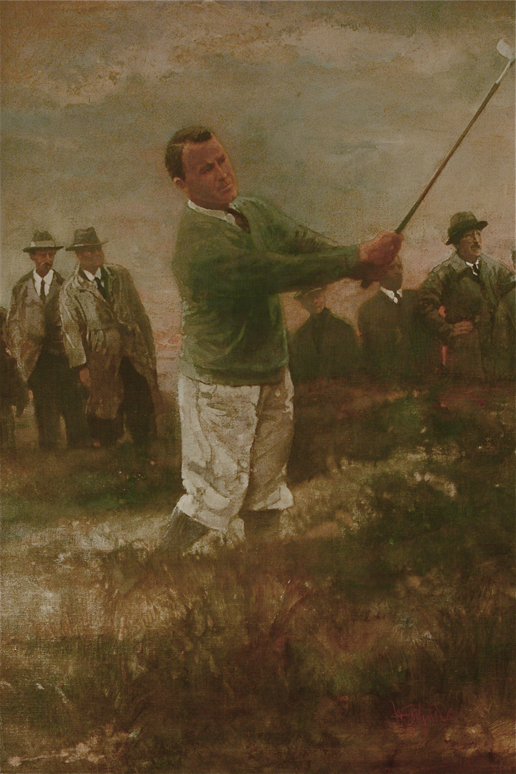 About Gene Sarazen - The Famous Wedge: The 1932 Open Championship was the 67th Open Championship, held 8–10 June at Prince's Golf Club in Sandwich,Kent, England. Sarazen led wire-to-wire to secure the fifth of his seven major champiosnhips. He won playing with the sand wedge he designed. Two weeks later in New York, Sarazen won theU.S. Open and joined Bobby Jones (1926, 1930) as the only two to win both the British Open and U.S. Open in the same year. According to his daughter, Mary Ann Sarazen, "Dad won the U.S. and British Opens with a nifty new club in his bag: a Wilson sand wedge that he designed. To this day people see my last name and say, "Tell me the story of how your father invented the sand wedge." Or, "Wow! Can you imagine how much money your father would have made had he applied for a patent on the sand wedge?" There's only one problem: My father didn't really invent the sand wedge. Scottish golfers in the 19th century had special clubs for getting out of the sand. Walter Hagen was using a battle ax of a sand wedge in the late 1920s, with a hickory shaft and a smooth concave face  later deemed illegal  with a lot of loft and about a half pound of weight in the flange. A man named Edwin K. MacLain had a patent on that club and assigned the rights to Hagen's manufacturing company. I know this because I sit on the USGA's museum and library committee with a man named Pete Georgiady, who is an expert on old clubs. Pete and I are both members of the Golf Collectors' Society. Oh, the things we talk about. You'd be amazed. What my dad did was design the first modern sand wedge, with a steel shaft, markings on the clubface and the amount of flange on it that is still widely used today."